For less than £20 you can have this compact and portable speaker system that weights just 282g and fits in your palm! Despite the tiny size, the unit somehow manages to fit in two exclusive speakers and a bass diaphragm to provide a big music experience and a 3D sound effect that makes you feel like you are in a cinema! 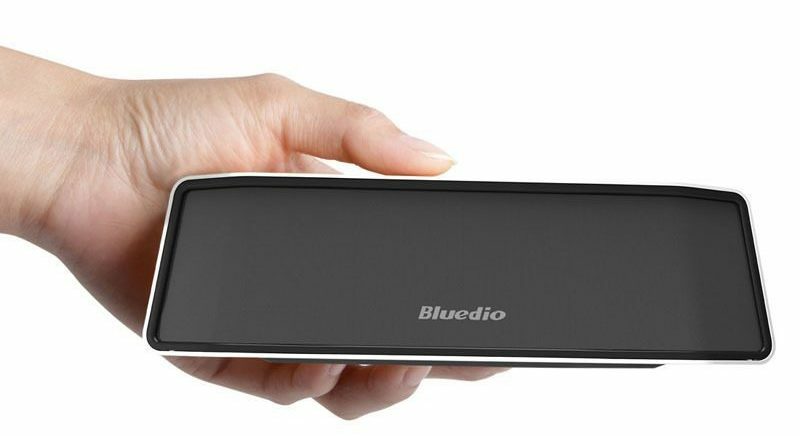 The volume from the Bluedio BS-2 is not the loudest on the market, but can still easily fill a large room. This speaker also has a simple and stylish design and is available in 4 colours: black, white, gold and silver. With good acoustic echo cancellation for the mic, the BS-2 makes a great hands free speaker with clear calls, plus the Bluetooth 4.1 chip supporting the latest Bluetooth standard means high speed data transmission and a smooth wireless music experience. Battery life is good too at up to 7 hours of continuous wireless music play time, plus around 1000 hours of standby time. A more expensive choice, but with premium performance, the Chialstar Wireless Sound Bar offers crystal-clear sound with powerful bass for a realistic virtual surround sound movie experience. You also get an AUX-RCA input, FM Radio, plus a Micro SD card slot that supports cards up to 32Gb. The Chialstar Wireless Speaker also connects easily to iPhones and iPads, plus all Android devices. A remote control is included and the Soundbar has a 2000mAh rechargeable battery. This unit really allows you to experience cinema quality surround sound via your computer, Tablet device or smartphone using Bluetooth. At around £35, this Avantrtee unit is a middle of the range portable speaker system with digital-signal-processing 3D surround sound effects from two powerful 5 watt speakers. A great Soundbar for iPods and iPads, but also with an additional audio line input for non-Bluetooth devices. Slim and stylish, this Avantree Portable Bluetooth 4.0 Speaker system is compatible with all Bluetooth-enabled devices and delivers a surprising full-range sound. Using Bluetooth version 4.0 for superior sound quality over wireless, this unit is capable of up to 6 hours of wireless playback on a single charge and takes around 3 hours plugged into USB to fully recharge. A USB charging cable along with a 3.5mm audio cable is included in the box.